DEAD STILL: A male Rhinella proboscidea frog (top) attempts to squeeze mature oocytes from a dead female. COURTESY OF DOMINGOS RODRIGUESFor many frog species, mating is a risky proposition. Males and females gather in veritable orgies that may last days or mere hours. Male frogs can become so desperate to find a mate that a group of writhing males will crush or drown the objects of their desire. But at least one species of Amazonian frog can apparently still produce offspring even if one partner dies in the process. Researchers have observed male Rhinella proboscidea frogs extracting and fertilizing their dead partners’ eggs. The finding was a surprise, says Henrique Caldeira Costa, a herpetologist at Federal University of Viçosa in Brazil. Other researchers have seen males of various species, from squirrels to penguins, attempting to mate with dead partners, but none “showed a situation where the necrophilia can bring a fitness gain.” Costa and colleagues published a report of a lizard engaging in the phenomenon in Herpetology Notes in 2010. 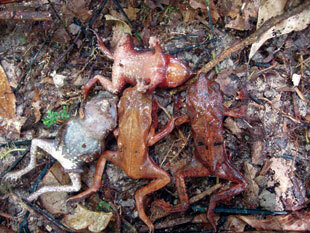 MATING MELEE: The bodies of dead female frogs (bottom) litter the forest floor after a mass-breeding event.COURTESY OF DOMINGOS RODRIGUESThe drawback is that females often die in the mating melee, apparently losing their chances to reproduce. But if a species is reproductively successful, a few dead females won’t tip the evolutionary balance against explosive breeding, explains ecologist William Magnusson of the National Institute of Amazonian Research (INPA) in Brazil, who coauthored the paper announcing the frog behavior (Journal of Natural History, 46:2961-67, 2012). The notion that dead females could still successfully reproduce first occurred to Thiago Izzo and Domingos Rodrigues in 2001, during field work in Brazil under the auspices of the Program for Planned Biodiversity and Ecosystem Research (PPBio), an initiative aimed at surveying biodiversity worldwide. 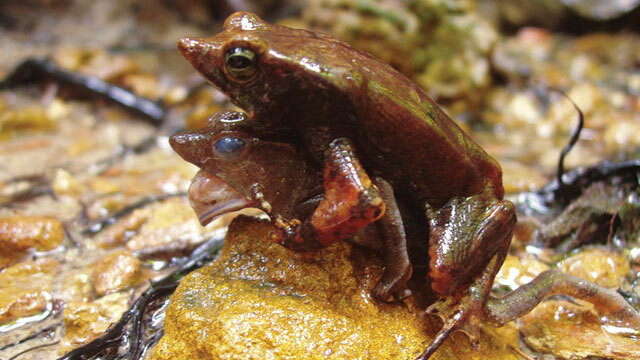 The researchers stumbled onto a group of reddish-brown R. proboscidea frogs in the process of mating. From a “mating ball” of about 100 males, the scientists pulled 20 dead females. Four years later, they came upon another explosive mating event and collected 5 dead females from a mating ball of 50 males. The researchers dissected the dead females to look for eggs—and found none, suggesting the males had successfully extracted all the oocytes from their unresponsive partners. In previously observed examples of overly optimistic—or desperate—animals romancing a dead mate, the practice has mostly been dismissed as a “behavioral mistake,” explains Costa, who concluded that the green ameiva lizard (Ameiva ameiva) he observed mating with a dead partner was fooled by the female’s sun-baked body temperature into thinking she was alive. But the R. proboscidea frogs were doing something unusual. As a male clasped his dead female, the scientists saw him squeezing rhythmically, coaxing a string of sticky eggs from her body. But had the males wasted their time? Stored in water-filled plastic bags, the eggs from several of these one-sided pairings began to develop—confirming that the males’ strategy was successful. But these observations can’t be definitively cited as evidence of a “functional necrophilic strategy” just yet, cautions Diego Gómez-Hoyos of the Wildlife Conservation Society. Without a better understanding of how much these matings contribute to the next generation, it’s too soon to know whether they really counterbalance lost fecundity due to female deaths. Gómez-Hoyos’s own observations of a different frog species gave no hint that the strategy offers males embracing dead females a reproductive leg up. It’s likely that male R. proboscidea frogs are probably just doing what frogs do—and still reaping the benefit, says Magnusson. The stroking motion is “frog foreplay” and normally stimulates egg release, which apparently works even when a mate no longer responds. Sztatecsny and his colleagues noted that a common toad female easily releases eggs immediately upon becoming aware of more than one male clasping her—possibly to end the encounter before too many more males arrive. So the ability of R. proboscidea females to release eggs after death might be the consequence of easy egg release designed to help females survive the attentions of too many males. Izzo and Rodrigues speculate that the “functional necrophilia” they observed helps maximize every frog’s mating investment. They also hypothesize that because it still allows excessively persistent males to reproduce, it relieves selective pressure against male aggression. How widespread the behavior is remains to be seen, and will depend on the species. Costa’s misguided lizard, for example, stood no chance because his mate needed to remain alive to nurture her fertilized eggs. But frogs and toads, which expel eggs before fertilization, have a better shot at making it work.